The brand new Weed Patch Mountain Trail near the town of Lake Lure in Rutherford County offers a long path into a remote section of backcountry with gorgeous views. The route, designed to allow hikers, climbers, and mountain bikers access to previously inaccessible forest, is part of a landmark project by Conserving Carolina and the North Carolina State Park system. The footpath is the latest segment of the Hickory Nut Gorge State Trail, which will eventually link more than 100 miles. To reach the Weed Patch trailhead, follow the Buffalo Creek Loop Trail clockwise for two miles to a junction marked by a kiosk. (Going counter-clockwise is shorter but follows a more strenuous grade.) From the junction, climb through the Trout Creek watershed. 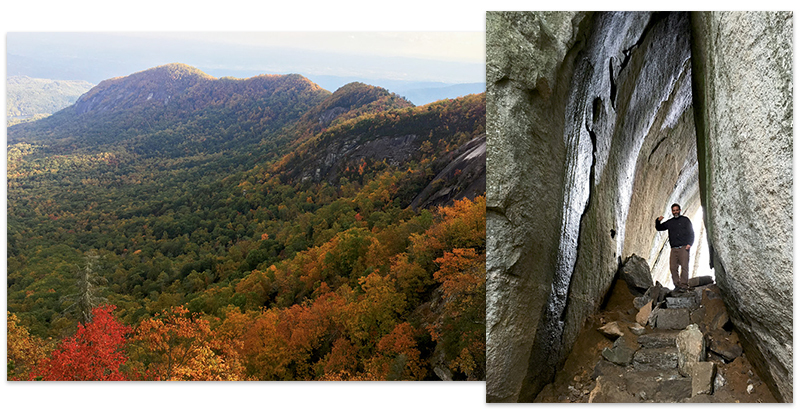 While the trail contours but never summits Weed Patch Mountain, it passes impressive rock features, old-growth forest, and mountain streams that are typical of the steep landscape along this portion of the Blue Ridge’s eastern escarpment. One highlight is at Grey Rock Cliff, near the trail’s midpoint, which offers stunning views of the north side of Rumbling Bald Mountain, a granite outcrop that sprawls along the adjacent ridgeline. Also, from Grey Rock is a view of the final destination, Eagle Rock. Currently, there is no public access at the western terminus at Eagle Rock, though Conserving Carolina and partners are working to obtain a path to a trailhead there. As a result, hikers must return the way they came. Navigate: From Morse Park in the town of Lake Lure, follow US 64/74A east for 5.8 miles. Turn left on Bill’s Creek Road and travel two miles to another left on Buffalo Creek Road. In 2.3 miles go right at the signs for Rumbling Bald Resort and continue for 1.7 miles to a small gravel parking lot on the left marked by a sign for Buffalo Creek Park.